The aim of this study is to analyse the occurrence of communication journals in the so-called Altmetrics (Facebook, Mendeley, Twitter, etc.) and how these indicators relate to each other and to the citations received. To this end, we study how the articles published by the Journal Citation Reports of the Web of Science for the 5-year period 2013–2017 on the Altmetric.com platform are registered. The results show how only a few platforms have significant coverage for studying the whole and in the case of Mendeley and Twitter, the coverage is superior to the citations offered by Web of Science. There is a proven relationship between citations and their occurrence on social media and platforms and their intensity varies by product. 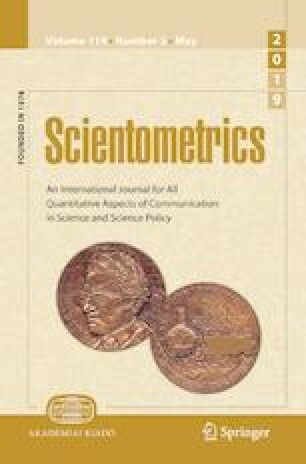 In general, the journals with the highest number of citations (Journal of Computer Mediated, Journal of Communication or New Media & Society) with few exceptions (Continuum) stand out. Colledge, L. (2017). Snowball metrics recipe book (3 ed.). Amsterdam: Snowball Metrics Program Partners. http://www.snowballmetrics.com/wp-content/uploads/snowball-recipe-book_HR.pdf. Moed, H. F. (2015). Altmetrics as traces of the computerization of the research process. https://arxiv.org/abs/1510.05131. Priem, J., Taraborelli, D., Groth, P., & Neylon, C. (2010). Altmetrics: A manifesto. http://altmetrics.org/manifesto. Wouters, P., Thelwall, M., Kousha, K., Waltman, L., de Rijcke, S., & Rushforth, A. (2015). The metric tide: Literature review (Supplementary Report I to the Independent Review of the Role of Metrics in Research Assessment and Management). https://doi.org/10.13140/rg.2.1.5066.3520. Zahedi, Z., Costas, R., & Wouters, P. (2014b). Assessing the impact of publications saved by Mendeley users: Is there any different pattern among users? In Proceedings of the IATUL conferences (pp. 1–13). https://doi.org/10.13140/2.1.1528.1280.